This week a visualisation to compare week to week data caught my eye. It visualizes the change in theoretical win rate (week by week) of the team in the NFL. First you have the full list of matches for each week and for each team the ‘predicted’ win rate for that match. On hover over a team it highlights all the matches of that team each week and combine them into a little flowchart so the smaller the line, the smaller the win rate in that time period. While it seems a little bit weird at first, it makes a reasonable good representation of the data. And having seen this we might use it ourselves to compare ranking of songs, maybe for a country over the weeks, maybe for a song over multiple countries, we’re still discussing about it. 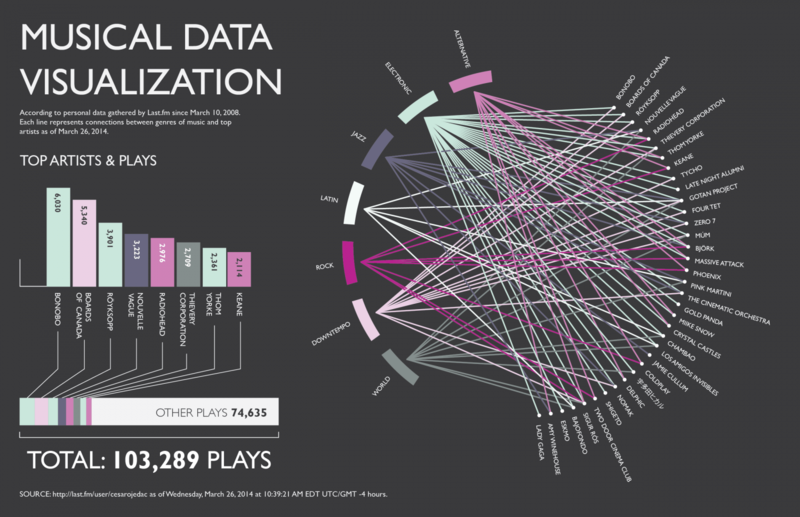 This visualisation was made based on 6 years worth of personal listening data from a user on Last.fm. On the left is a bar chart of the artists this person listened most to and how many times he listened to them. Underneath, they are represented as a part of his total song plays. On the right, which I think is the more interesting visualisation, the artists he listened to are connected to a genre. The main thing I learn from this visualisation is the importance of choosing the right colours for your visualisation. In the right part of the image, it is still somewhat ok, but it is hard to distinguish the different parts on the left visualisation of the total plays. Apart from that, I think the visualisation on the right does a good job of representing the connections, but a nice addition would have been to make it hoverable, so that if you for example hovered over a genre, only the lines connected to that genre would be visible. This week I look into the choropleth, and this compared to the cartogram, which I discussed last week. I also discuss which of both representations would be more relevant to our project. Within a choropleth areas do not get distorted which makes it easier to recognize the global geographical area being discussed and its regions. This regions will be colored using a color scale from low to high to visualize some quantitive data. Within a cartogram areas do get distorted which may make it more difficult to recognize the geographical areas, yet it adds another dimension to the visualization by scaling the regions relative to the quantitive data being visualized. On a world scale a cartogram will also make it possible to quickly spot small countries with a high value for the data being visualized, while this may go lost with a choropleth. Yet, this downsize of a choropleth on world scale may be solved by allowing zooming upon the world map. However, this solution doesn’t solve the problem at first glance but only upon further exploration. The best visualization way will this depend on the situation. More concretely whether it is most important to be able to recognize the geographical areas easily or to be able to see also the small countries with high values at first glance. In our visualization, we can ask the question whether it is important for the user to know the exact information per country at first glance or it is more important to see a spreading pattern over countries in which the user can easily recognize the geographical positioning of this pattern.